DNA Forensics Laboratory Pvt. Ltd. is providing Forensics Handwriting Examination, Handwriting Analysis, signature analysis and also documents analysis to public and private sector clients. DNA Forensics has taken utmost advantage of the fact that no two writers can exhibit identical features in handwriting and there is variation in each. There has been years of meticulous research that shows the writing of thousands of people and none of them was identical. We all have diverse combinations of characters. Document analysis is a methodical process and needs extensive knowledge. 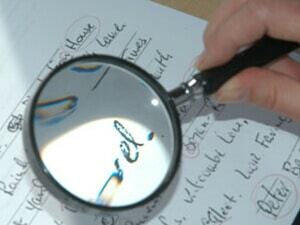 Handwriting analysis helps to solve cases of fraud, forgery, alteration, ransom notes and forged cheques. Our handwriting experts compare handwriting, signatures, initials and even numerals. Was the suicide note actually written by the deceased or the criminal? This question itself brings many thoughts to our mind. DNA Forensics Laboratory Pvt. Ltd. has always aided people to answer many questions that couldn’t have been answered otherwise. We at, DNA Forensics Laboratory Pvt. Ltd. made sure that science is put to a use to help humanity in a way that nothing could. These documents that are in doubt are called ‘questioned documents’. Our experts can see even the invisible marks on the document. It provides information that is quite crucial and may help to conclude the case. No doubt things have become easy in this digital era, but at the same time it has become easier for criminals to manipulate and create documents that are fraud. DNA Forensics Laboratory Pvt. Ltd. determines if the document is genuine or not. They also tell you the creator of the document, the time frame, material used and also the modifications made. The stamp, ink or tools used can be used as a lead to get hold of the criminal. Our experts can also identify marks that are invisible to the naked eye. Our experts can also analyze the psychology of the author. The fine motor skills can affect the writing and our experts can identify the state of mind of the author. So the next time you are doubtful about the authorship of a will or an anonymous note, feel free to call DNA Forensics Laboratory Pvt. Ltd. Please feel free to call our Forensics expert for any further communication at: +91 8010177771 or you may schedule an appointment with us by WhatsApp us at: +91 9213177771.